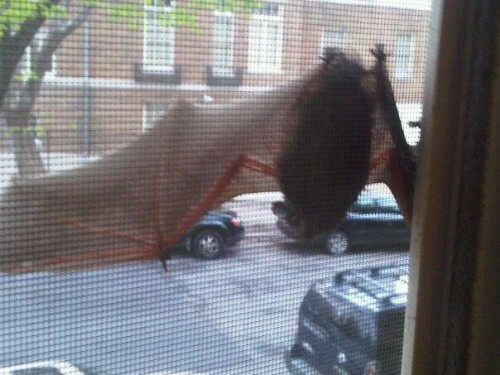 I snapped this picture of a bat clinging to my bedroom window in Woodley Park yesterday afternoon. Is this normal for DC? Should bats be out during the day? I poked at the screen from the inside, but instead of flying away the bat hissed at me and extended its wings. It wasn’t really causing any harm, so I let it be (i.e. my wife was convinced that if I kept poking at it, the screen would fall out, the bat would fly in, and we would both perish in a bat related incident). It stayed put for about 4 more hours, before flying off. Maybe this would be worthy of an afternoon animal fix? There’s no rule that the animals have to be cute, right? Anyone else ever see a bat in DC? In the daytime?